Friday saw me on a serious thrifting mission, I needed a fix and set myself a mental budget of about £10 to get it. I'd planned to head out to a car boot sale this morning too but after a late night with friends and dropping into bed around 2 I thought I'd spare passers by the sight of me, bright and breezy as a slug, shuffling my way round trying to bag a bargain at 7.00am! 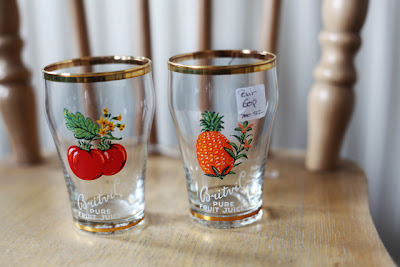 The first thing I thought of when I spotted these Britvic juice glasses, beside the amazing price tag of only 60p for the pair, was a fellow thrifty chick - Scarlett of Scarlett Loves Elvis - as I'm fairly sure these would be right up her street. 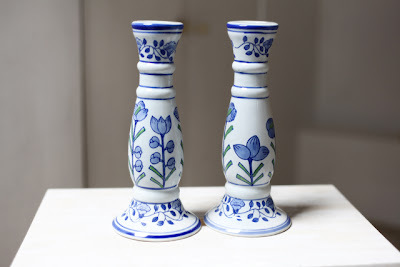 I'm absolutely in love with all things Anthropologie, the home section is crammed with gorgeous buys and I'd seen some candlesticks very similar to those above on their website last year then missed them in the sale. These were £1 for the pair and I can't wait to find candles to fit! 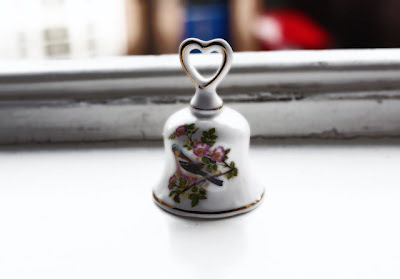 The hexagonal Japanese plate and the little English made porcelain bell (was smitten by the heart shaped handle and little bird!) 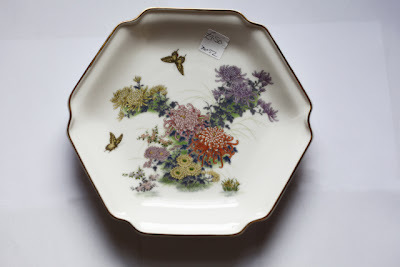 were being sold as a set for £1.50 - absolutely no connection to one another but I can never resist anything pretty made of china. 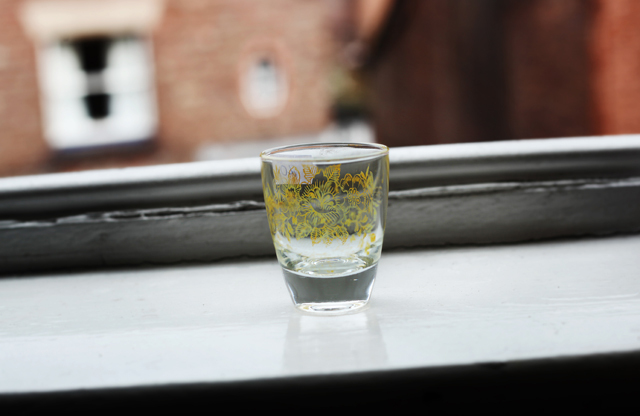 Little retro shot glass with yellow floral transfer, worn in places = winner at 20p. Will probably struggle to fit a tea light inside so it'll sit on a windowsill somewhere in the house. I think the little stand is made of pewter or was silver plated at some point but I'm a bit of a weirdo and like the tarnished surface so snapped it up for £1. The glass bottle was peeking out from behind the juice glasses, I plonked it down onto the stand and it looked so nice I had to have that too at £1.50. I can't fathom what it bottle was used to decant though, sherry perhaps or maybe vinegar? Answers on a postcard! 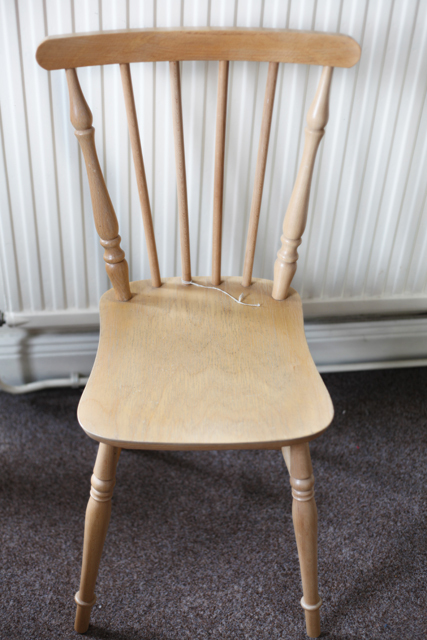 Last but by no means least, and my star buy of the day, this farmhouse chair: £5! There are three more left in the shop and I'm sorely tempted to pick up another before they all vanish but I should probably decide what to do with this one first - paint, decoupage, wax, stain - any thoughts? So £10.80 the lot and a chair makeover in the pipeline, a successful charity shop swoop! Love your finds - especially the candle sticks! 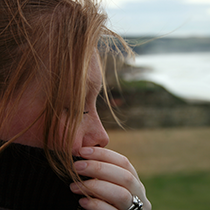 Setting a mental budget - great idea! Fab chair, hmm would be a chance for a make-over a la Scarlett, or maybe just a duck-egg blue paint that you could distress a little? And I love the candlesticks - Anthropologie is lovely but is usually so expensive.Yours are perfect, who needs the high end high street? WOOHOO!! i'm in love with the glasses, sooo cutee and it's great that for £10.80 you got such treasures! i wish i live near you so i could also grab those chairs for £5!!! the pewter looks so elegant and expensive looking and the porcelain bell with heart shaped and bird is making me go ..ooooooohhh. Seems like another success thrifting mission. love 'em!! Hi Jem...love to see your scores...they are great! Thanks for sharing in my newbie party. Hmmmm - the chair has so many possibilities. I would paint them (yes - go buy the other one) to match your candlesticks! Found you on Debb's Newbie party and I am your 101st follower! Hi there! I saw your name on Debbie's blog and had to pop over! 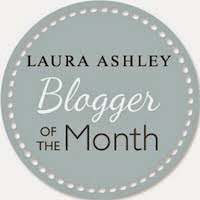 My daughter's name is Jemma and I couldn't resist taking a peek at your blog! It is absolutely lovely and you have some amazing photography skills! We love England and have been several times. One of my best friends lives in Alton. We are going for a visit next year and I can't wait! So nice to "meet" you! Have a great week! Lovely finds Jem! I adore the little glass bottle. 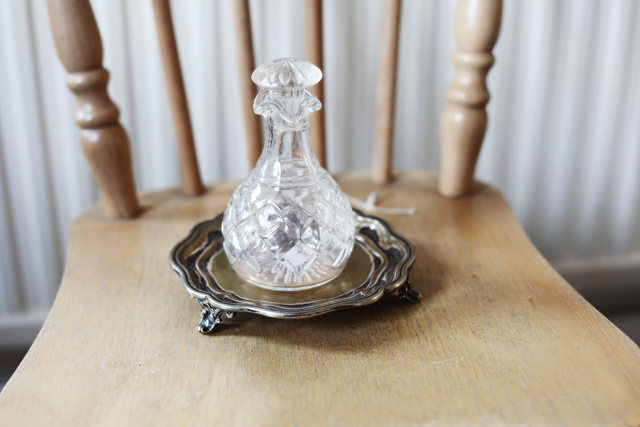 Could it be an old perfume bottle? I would have to go back for more chairs too. Look forward to seeing what you end up doing with it. Jem, you've got to buy the other chairs and quick!! I love your idea of duck egg blue and am also loving the decoupage idea. Look forward to seeing what you do. You are the most fabulous thrifty store shopper ever!! Another amazing haul! I love the words we use for shopping at charity shops. Swoop is a good one. I have too many chairs so don't want anymore but I love your shot glasses especially the fruity ones and also like your cute bottle and the pewteresque stand. I love your chair!! I'd be straight back for the others though - sod the budget LOL. Wow - great finds - and just over a tenner for the lot? you can't say fairer than that! Love the blue and white candle sticks and of course the chair which absolutely would have to be painted white and have a gorgeous shabby chic seat cushion with ties. Such beautiful finds. The blue and white candle sticks grabbed my eye at Debbie's party. I am your latest follower. I would love for you to come and check out my blog and follow me back at www.diybydesign.blogspot.com. Thanks so much. Great finds, I love the candle sticks. Looks like you had a whole lot of fun! I like the little tray. It's all very Anthropologie (I love their stuff too! ), fab finds. I especially love the little decanter and stand.